Highly innovative table tennis blade of premium-quality, manufactured at the highest state of the art using German raw materials. The DYMAX Zenturio sets new standards with regards to speed and control. The patent pending racket comes with a newly developed and unique antishock system which consists of a special cushioning in the handle. The vibrations of the racket blade are being absorbed using a specially engineered material Made in Germany. Along with a copper insert that is unique in the world, the blade offers optimal use of the sweet spot and an all-time level of control. The topspin play over-the-table and at a mid-distance can be very easily controlled at a higher punch. Conventional fabric linings shortly influence the bounce of the ball negatively, e.g. due to humidity (sweat). On the other hand, the DYMAX Zenturio blades have a stable and constant bounce of the ball over a long period – thanks to the copper insert, as copper hardly reacts with humidity. 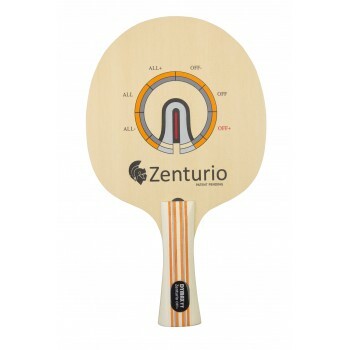 The Zenturio blades are equipped with Hinoki face veneers, the core and middle veneers are medium resp. medium-hard – depending on the speed level. See for yourself and go for this exceptional and luxurious table tennis blade, produced with German raw materials and outstanding German technology!